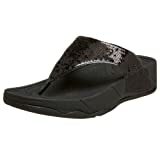 Electrify your look while getting fit with the FitFlop™ Electra thong sandal. Synthetic upper with allover sequins for added flair. Super-slim™ leather toe post ensures an unbelievable wearing experience. Soft microfiber interior lining helps prevent abrasion for all-day wear. Muscle-loading Microwobbleboard technology increases the time your muscles are engaged with a high-density heel, low-density midsection and mid-density toe cap. Textured outsole within embossed logo and FitFlop’s famous “work out while you walk™” detail.